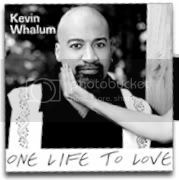 Kevin Whalum's Page - THE JAZZ NETWORK WORLDWIDE "A GREAT PLACE TO HANG"
Kevin Whalum is the youngest of the three most talented brothers to ever come out of Memphis, Tennessee. Kevin has sung with his brother, Kirk periodically, since Kirk's 'Cache' release, many years ago. Since then, he has also worked with Michael McDonald, Take 6, George Duke, Rex Rideout, Patti Austin, James Ingram and others. Kevin attributes this success to his undying faith in the Lord God. "One Life To Love" is Kevin’s sophomore project. It was produced by George Duke and Rex Rideout. Feeling happy and blessed, while living in Nashville, Tennessee with his wonderful and beautiful wife Camille, and equally beautiful twin daughters, Kellen and Kaylah, Kevin continues to plan his future. Wonderful to meet you here Kevin - loving your fabulous music!!! Enjoy your weekend! You are amazing!! A true godsend!! Love ur voice!! God Bless u brother!! And yet another Whalum. This place is going to rock now. KEEP THEM WHALUMS COMIN'! Good Day Mr. Whalum. Its great to actually be able to tell you that you've done some great work.